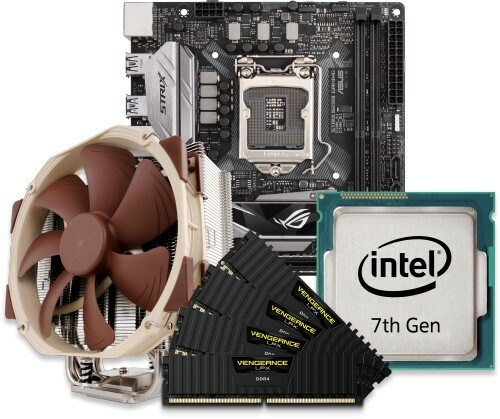 Based around Intel's 7th generation CPU, this pre-built bundle is ideal for customers looking to take the strain out of putting the core components of a PC together. This particular bundle includes a 7th generation Intel CPU, ASUS motherboard, RAM from Corsair and your choice of either a fanned CPU cooler from Noctua or a fanless one from Nofan. As with all our bundles, our experts will assemble it and run specialised software to ensure it all works as expected prior to shipping. Intel are the without a doubt the most popular processor manufacturer in the world and their 7th gen CPUs offer great performance and feature a wide range of performance levels from their Pentium range all the way through to the high-performing quad core Core i7. We have a selection of motherboards available from ASUS and ASRock. Each motherboard offers something different each other. The ASUS B250I is ideal for customers looking for good solid performance without the use of RAID. While the ASRock Z270 offers everything the previous motherboard does but with the added benefit of RAID support plus it features a HDMI 2.0 port, allowing it to connect to a 4K display while running at 60Hz. This is ideal with you intend to use your system as a media player and want the best possible resolution. It is possible to purchase this bundle without a CPU cooler preinstalled. This is for customers who plan to use this bundle in a fanless chassis, like those available from Streacom. This is because these type of chassis include an integrated CPU cooler as part of its design. If you decided to purchase this bundle without a CPU cooler we will still perform all tests with a temporary CPU cooler installed. In recent years, Corsair have expanded their product portfolio to include many different types of PC related products but they are most popularly known for memory. The memory we use in our bundles is the Corsair DDR4 Vengeance LPX running at 2400MHz.